- The S-Series 10 is a ten inch platform bed mattress that can be used on a platform base or adjustable bed frame. The unique open-cell structure of the S-Series Serene Foam is designed so that air is filtered in and out of the mattress when you move on it. This "active air" technology makes for a cooler, dryer, more comfortable feel.  1 inch of Hole Punched Serene Comfort foam with Active Air technology. 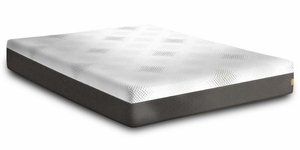  7 inches of 1.8 LB Hight Resiliency CertiPUR-US® foam.